Directed by acclaimed filmmaker Sally Potter, who brought us Rage, Orlando and The Tango Lesson, sixties British drama Ginger & Rosa features two outstanding lead performances from Elle Fanning and Alice Englert as the film’s titular best friend protagonists. To celebrate the DVD and Blu-ray release of Potter’s Ginger & Rosa on Monday 11 February, we have THREE Blu-ray copies of the film to give away to our army of cinephile readers, courtesy of the kind folks at UK distributor Artificial Eye. This is an exclusive competition for our Facebook and Twitter fans, so if you haven’t already, ‘Like’ us at facebook.com/CineVueUK or follow us @CineVue before answering the question below. Potter’s latest film is an evocative and beautifully shot portrait of post-war Britain, as seen through the eyes of Fanning’s impressionable young teenager. She plays Ginger, who finds herself increasingly estranged from her mother (Christina Hendricks) and drawn further into the world of her pacifist and anti-nuclear activist father (Alessandro Nivola). However, her friendship with the fiery Rosa (Englert) is severely tested by his unconventional lifestyle and their relationship threatens to explode like the bomb that threatens them all. The result is a passionate, moving and intelligent examination of political and personal responsibility, portrayed in exquisite detail by some of the greatest acting and directing talents. Ginger & Rosa filmmaker Sally Potter directed Tilda Swinton in which sweeping period epic? 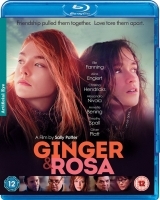 Ginger & Rosa is released on Blu-ray and DVD on 11 February, courtesy of Artificial Eye.